My adventures into computer audio began with my most recent review of the Empirical Audio TurboMod-ified Benchmark DAC-1 with Off-Ramp I²S, using a Toshiba laptop computer as music server. While I was hampered by a number of technical foibles including pops and ticks during playback, there was much to be said for both Empirical Audio's jitter reduction and the sonic strengths of their components. For those who have not read the Benchmark DAC-1 review, you might want to go back and read the portion on how Steve Nugent, Empirical Audio's sole proprietor, tackles jitter in his designs. To add to this discussion, I recently came across an interesting rant on a DIY web site. While the article needs editing, there is some good straight talk, even with some commentary by current engineering degree graduates, about the existence and potential importance of jitter. USB converter clocked by a modified Superclock 4"
The Spoiler was inspired by Steve's work on modifying the Chinese-made $368 Lite Audio DAC-60 for a customer. 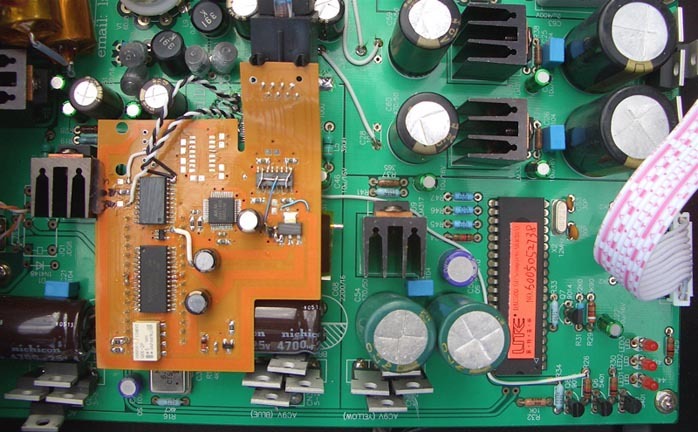 At first, he used the circuit board, transformers and chassis from the Lite DAC but upgraded everything, made extensive changes to the board wiring and added boards for converting the USB input to I²S (essentially an internal Off-Ramp I²S). After he was satisfied with the results, he then made "things his own" by replacing much of the hardware as well. A slight digression on the topic of a designer's choice of DAC chips might be in order. Since the Spoiler is based on the Lite Audio DAC-60, it runs the stock Burr-Brown PCM1704U-K DAC chip. The 'K' designation means the highest grade of the 1740U chip. This is very highly regarded silicon and has been used in a number of high-end products such as the Cary 303/200, Mark Levinson 30.6 and Linn CD12 machines. Steve Nugent's comments on these DAC chips are: "The DF1704 and PCM1704 chip set is one of the best-sounding D/A chip sets ever made. The only ones that come close are the newer PCM1796/1798 and the AD1853 in my opinion." I also found the following post on the DIYaudio.com digital forum about the PCM1704U-K DAC chip: "Note that this chip was designed with audiophile high performance in mind, by the original Burr Brown company before it was acquired by Texas Instruments. This is the only true 24-bit DAC in the traditional (non delta-sigma) parallel architecture. This approach is considered to be superior in sound quality, with excellent jitter rejection." On the other hand, in the November 2006 Stereophile review of the highly acclaimed Zanden 5000 Mk.IV/Signature D/A converter and 2000 Premium CD transport, this $15,470 DAC uses the vintage Philips TDA-1541A 'double crown' 16-bit DAC chip designed circa 1985. The article quotes Zanden as calling this "the best sounding chip ever made". In fact, in Srajan's just-penned laudatory review of the $8,500 Abbingdon Music Research CD-77 player, the standard TDA-1541A chip makes an appearance. So, it is quite apparent that the need to have the latest and greatest, let alone a 24-bit chip with or without oversampling or upsampling, is very much open to debate. My tweaked-out Audio Note DAC Kit 1.2, my reference, uses the Crystal CS8412 receiver and the Analog Devices AD1865N 18-bit chip. Steve shipped me the Spoiler DAC along with the same Toshiba laptop I had used previously. I also received the optional outboard battery power supply (BPS). The Spoiler, supplied with the Siemens CCA 6922 tubes and the custom power cord, retails at $5,999 and is sold direct only. Steve has no dealers. I connected the Toshiba laptop to the Spoiler directly via USB. Since the Off-Ramp I²S circuit resides inside the Spoiler and not external as with Steve's modified converters, the external I²S box and its I²S cable to the DAC are eliminated. This is welcome since I am one of those who value the least amount of boxes and cables necessary to get the best sound possible. At the output of the Spoiler, I hitched my trusty Harmony Audio interconnects to connect to my Hovland HP-100 preamp. The BPS has one power cord connected to a wall wart transformer to charge the battery and another one to an AC adaptor. There is a small toggle switch on the battery supply that allows the user to switch between AC and battery supply. A twisted wire pair from the BPS plugs into a socket on the Spoiler's rear. Jumping ahead, I was unable to hear much if any difference between AC versus DC power. However, the charge indicator on the BPS showed a constant low charge (one red bar on the display) and Steve opined that there might have been a problem with the battery. Therefore, I performed the entire review with the AC-powered Spoiler. Upon return of the review loaner, Steve Nugent found the BPS to be working fine. Why the charger showed only one red bar in my digs remains a mystery. My first inclination was to play the same tracks that were still stored on the computer's play list from my last review of the Empirical Audio-modified Benchmark DAC-1. I started with the Beatles' Sergeant Pepper title track, which had sounded somewhat harsh over the Benchmark. (Readers should note that Steve Nugent has since modified the Benchmark to address the harshness complaint from me and apparently other users). This Beatles track is from the native 24-bit/ 96kHz play list. I am happy to report that the Spoiler is far better than the Benchmark in this regard, navigating the most raucous portions of the track with total grace. Moving on to my favorite 24/96 track from the play list, Frank Sinatra's What's New [Capitol], I was left a little wanting. With the Benchmark DAC-1, this track had been simply breathtaking. The refrain where Frank goes up an octave then exploded into the room, causing my visiting friend Kate to swoon into a complete meltdown on my listening sofa. This time, the explosion was of a lower caliber and thus, some of the emotion was robbed from this track. There was also less focus to the soundstage, with individual instruments and voices having less distinct outlines. My system excels at carving out distinct corporeal images so this criticism will probably be of lesser significance in most systems. A classical piece on the 24/96 play list with a solo violin performance by Friedman was another track that had been harsh with the Benchmark. Played through the Spoiler, I'd have to agree with Steve Nugent's own assessment on his website that his Spoiler renders violin exceptionally well. Tone was just right. I was beginning to nurse a notion about how hard it would be to wrest a nasty sound from this DAC. Tonally, the Spoiler does indeed surpass the modified Benchmark. One issue that continued to plague me was the pops and ticks during playback. During the review, Steve sent me two emails with tweaks to do to the computer to improve performance as well as hopefully reduce the pops and ticks. The first email had me do changes to disc caching, memory cache and playback thread priority. The second email contained a link to a pdf file from Tascam entitled "Optimizing Windows 2000 and Windows XP for Audio". This is a 23-page long document but the first 10 pages have to do directly with tweaks during the initial software installation. Your natural reaction at this point might be to wonder what laptop to buy in order to optimize your audio playback. Steve's advice on this question, gleaned from an Audio Circle post, is: "I have had good luck with full-featured Toshibas in the $1500 -$2000 range. I would only buy an expensive Sony Vaio, not a cheap one. HP Pavilions are good and have large disk availability. Make sure that you get a large disk; 2Gbytes of DRAM; a fast CPU, at least 1GHz, preferably Pentium; and a fast CD/DVD ROM drive for fast rips (these usually only come on more expensive laptop)." In particular, Steve reports that a number of his customers have been pleased with the HP Pavilion 8000 series with dual 120GB of storage. He said that with an average of 60MB per track, this would hold around 4,000 tracks. A song I used extensively when reviewing the Empirical Audio-modified Benchmark DAC-1 was the title track from Roseanne Cash's The Wheel [Columbia CK 52729]. This is one of three tracks from this CD that I uploaded to the Toshiba hard disk using the supplied Exact Audio Copy freeware. Switching back and forth between the Toshiba/Spoiler versus playing the CD from my Vecteur D-2 transport and tweaked-out Audio Note 1.2 DAC (V/AN), there were clear and prominent differences. Roseanne's voice took on an easier, more relaxed quality with the Spoiler. However, the Vecteur/Audio Note, while having more bite, also had much more powerful bass, crisper transients and better dynamics. The V/AN combo simply drives the music with more verve. This comparison surprised me since Steve Nugent's lower-priced, fully modified Benchmark had stunning dynamics. The bass from the Spoiler goes deeper than the V/AN, it just does not have the mid-bass slam, which for me is so important for an involving listening experience. Neither is the Spoiler's bass as clean and informative as the bass from the V/AN. Putting it another way, the Spoiler's bass was more rounded and diffuse. This, again, may be less audible on many systems. My Audio Physic Step SLE /Luna subwoofer combo has unusual transparency in the bass. That's a hard commodity to come by and a compelling argument for a superior subwoofer. The remaining two Roseanne Cash tracks reinforced these impressions. Even more surprising was that the V/AN combination was more nuanced and detailed, with more decay on John Leventhal's guitar on Tears Falling Down. The same hardware comparison was done with the other CD I had uploaded, Art Farmer's Ph.D [Contemporary CCD-14055-2]. On Track 2, "Affair D'Amour", not only was the acoustic bass cleaner and more powerful with the V/AN but the cymbal work showed that the treble was also more extended. Thinking that perhaps the Siemens CCA 6922 tubes were showing some age, I tested them on my calibrated Hickok 539B tube tester. They tested like new. The most notable design feature for Empirical Audio's approach to computer audio playback is optimizing the I²S data transfer between computer and DAC via the Off-Ramp. Nevertheless, the Benchmark DAC-1 and Spoiler Tube DAC still retain an S/PDIF input. I can't imagine someone purchasing today's DAC to use this way but the socket's presence did allow me to compare computer playback versus the Vecteur D-2 transport. As with the Benchmark DAC-1, playback via the Off-Ramp I²S (internal to the Spoiler) was superior to the S/PDIF input in every way: detail, dynamics, clarity etc. So, as before, it seems that Steve Nugent has the computer side of the equation licked. In my opinion, he has not quite yet reached the same level of accomplishment with his Spoiler DAC. I think that a product at this price level should outperform my V/AN combo in every way. It does not. Where does this leave a potential Empirical Audio customer? If you read my Benchmark DAC-1 review, you might remember that my friend Dan owns the Empirical Audio-modified NorthStar 192 transport/DAC combination. Since then, Dan has had the remaining TurboMod and Superclock 4 upgrades/modifications done. According to the Empirical Audio website, the prices for the units are as follows: NorthStar 192 transport with TurboMod and Superclock 4 is $3,000, NorthStar 192 DAC with TurboMod is $2,750. One morning, Dan brought over the Empirical Audio TurboMod NorthStar transport and DAC for some listening comparisons to my V/AN combo. For your information, Vecteur products, made in France, are no longer imported and Audio Note's latest comparable DAC kit is the model 2.1. Original retail prices were Vecteur D-2 transport $1090, Audio Note 1.2 DAC $1,099 in kit form (plus a few hundred more for my tweaks/upgrades). Keep in mind that this comparison was between the V/AN 16-bit 44.1kHz versus the NorthStar's 24-bit 192kHz upsampled playback. Miles Davis' Birth of the Cool [Capitol CDP 7 92862 2] was the first disk played, starting with track one, "Boplicity". The NorthStar, like the Spoiler, is smoother and less forward sounding than the V/AN combo. The TNT-Audio review of the NorthStar M192 DAC did make note of some weaknesses in the midbass. Steve Nugent's mods on the NorthStar improve the bass performance, however it is still lacking in comparison to the V/AN combo. The NorthStar goes deep but like the Spoiler, it just doesn't have the midbass slam and overall dynamics of the V/AN. I would agree with the TNT-Audio reviewer Lucio Cadeddu however that the dynamics are sufficient to support the musical message. Leading edges are again not as crisp as with the V/AN. The Empirical Audio-modified NorthStar combination, in every other way, is a wonderful sounding transport/DAC combination. On Alison Kraus, Every Time You Say Goodbye [Rounder CD 0585], Tim Stafford's lead vocal on "Another Day, Another Dollar" was smooth and natural. The soundstage was wide and deep and detail was unraveled in great abundance. It also had an ease to the sound that let you listen without fatigue. The V/AN combo is not as easy on the ears. Dan and I went on a little country music jag, continuing with Kathy Mattea's Lonesome Standard Time [Mercury 314-512-567-2], and Michelle Shocked's Arkansas Traveler [Mercury 314 512 101-2]. Both Kathy and Michelle's voice were slightly leaner through the NorthStar but not objectionably so. The soundstage grew even larger as the NorthStar warmed up. The resolution of the NorthStar with the 192kHz upsampling is as good as anything I've heard. Note that I have not heard the big gun players in my system like the Reimyo, Zanden and the new AMR CD-77. Of course, this is not a review of the Empirical Audio-modified NorthStar 192 transport/DAC. It's just another product modified by Empirical Audio that was available to me and thus made sense to be included. At this point in the rapidly evolving product development at Empirical Audio, I would recommend the NorthStar 192 DAC either with the computer front end (which I was unable to audition this time around but which was superior to my Vecteur and the NorthStar transports in the Benchmark review) or with the Empirical Audio-modified NorthStar 192 transport. I know how Steve Nugent feels the Spoiler to outperform the NorthStar but I respectfully disagree. The Spoiler is certainly not as refined but it does have a fullness of tone that the NorthStar and Benchmark lack. It also has an easy-on-the-ears tonal balance with an upper midrange that is particularly welcome on harsher recordings. I know Steve Nugent himself uses solid-state amps and ribbon speakers (Spoiler DAC, modified Mark Levinson #38 preamp, modded Parasound JC-1 monoblocks, modded Soundline Ribbon speakers), so I would not be surprised if his take on voicing his products could be quite different than my all-tube, mini-monitor/sub system. This may account for some of my criticisms. These will make it sound slightly better, but still close. The goal is that there is nothing in this DAC that can be modded to make it sound better." Well, this goal continued moving. I got an email from Steve Nugent on April 4, 2007 with the following update: "I believe the Spoiler may need a bit of tweaking in the DAC output filters. It could probably run without any filters depending on the tubes used. The one I'm currently building will be the guinea pig for reducing the filtering. I also have Teflon caps for the filters rather than the Polystyrenes that are in the one you reviewed." I do not doubt that Steve Nugent will meet his goal of designing the ultimate USB DAC. He is certainly nibbling around the edges and if he could combine the bass and dynamics of the Benchmark, the resolution of the NorthStar and the fullness of tone of the Spoiler, he would have it made. I think it's just a matter of time. For now, from what I've heard of Empirical Audio's current line of computer audio products (TurboMod Benchmark DAC-1, TurboMod NorthStar 192 DAC, Spoiler DAC), my nod goes to the TurboMod NorthStar 192 DAC. While I was unable to listen to the NorthStar 192 DAC with the laptop/Off-Ramp I²S front end in this review (since I did not have an external Off-Ramp I²S unit on hand), I did hear the laptop with the NorthStar 192 DAC during my review of the Benchmark. At that time, the laptop outperformed both the NorthStar transport and my Vecteur D-2. 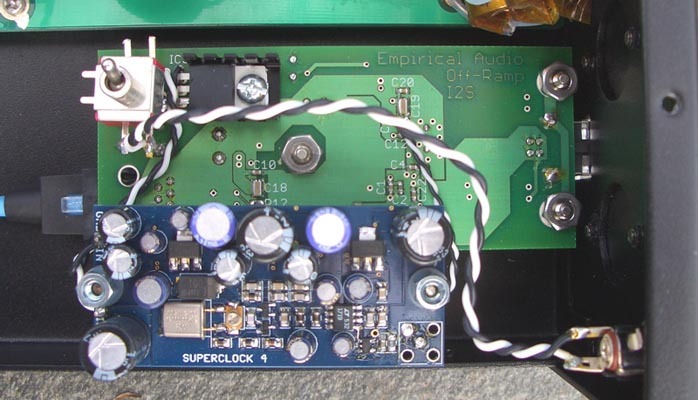 Since the Benchmark review, Steve Nugent has installed his full TurboMod on my friend's NorthStar DAC and upgraded the Superclock 3 to Superclock 4. The improvements to the DAC are quite significant so I feel I can safely recommend the laptop with the TurboMod NorthStar 192 DAC. Of course, using the NorthStar 192 DAC with a laptop and Off-Ramp I²S, you cannot get the full 192kHz upsampling provided by the NorthStar 192 transport. (As an explanatory note, when the NorthStar 192 transport is used into the 192 DAC's S/PDIF input, the DAC does the upsampling. When the NorthStar 192 transport is used into the DAC's I²S input, the transport does the upsampling.) Using the laptop into the DAC's I²S input, the upsampling will be done by the computer's SRC resampler software. The upsampled output of the computer into the USB cable is currently bandwidth-limited to a 24-bit/96kHz data stream. I would be remiss not to mention that the product which started me on this exploration of Empirical Audio's computer audio products was the TurboMod Perpetual Technologies P-3A DAC which is still of interest to me. At the time, the P-3A with an outboard monolithic power supply was part of an equipment loan during my Bastanis Prometheus Mk. II speaker review. 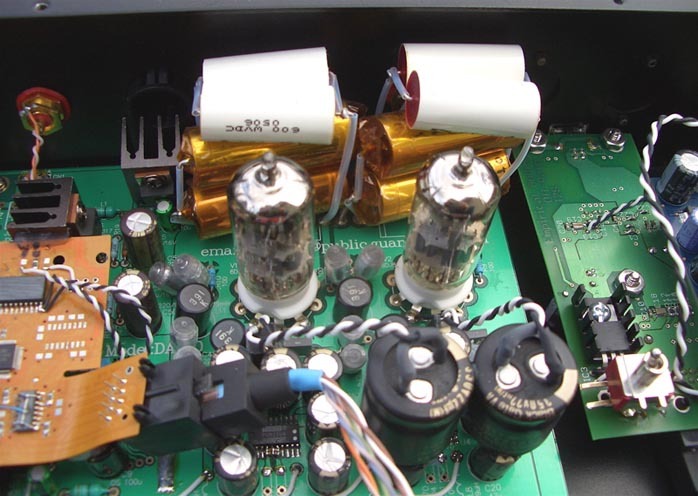 The TurboMod P-3A, even hampered by my use of its S/PDIF input (rather than the preferable I²S input) and fed by the digital out of my 'lowly' NAD 5000 CD player, had explosive dynamics and a wealth of detail. In a recent conversation with Bill Allen, the Bastanis importer who loaned me the TurboMod P-3A, he felt the P-3A to be a little lean. From what I heard, that may or may not be true. I think Bill prefers a somewhat lusher presentation than I do. Bill currently uses the same Empirical Audio TurboMod NorthStar 192 transport/DAC combo that I auditioned during this review. He feels the NorthStar DAC outperforms the P-3A. Steve Nugent apparently agrees and no longer offers the P-3A TurboMod. Although I did not hear the TurboMod P-3A in the same system, my sonic memory tells me that the TurboMod P-3A has better dynamics and detail than the Spoiler, better dynamics (but not detail) than the NorthStar 192 DAC and smoother upper mids than the TurboMod Benchmark DAC-1 (as previously noted, the current TurboMod Benchmark version supposedly improves the upper mids). For me then, questions remain about the TurboMod P-3A in relation to Empirical Audio's current line of TurboMod DACs. Audiophiles are still confronted with some very difficult decisions in choosing among digital playback technologies and products. Those who are willing to put in the time to upload their CD collection to hard drive can choose from an ever-expanding range of USB DACs. They will benefit from the convenience of easier access to their music, elimination of compact disk storage and the option of software-based upsampling (most notably with SRC Resampler on PCs). On the other hand, there are many who do not want to be bothered by the effort of uploading their CDs. For those sticking with the silver disks, audio engineers are finding ways to push the envelope of standard Redbook 16-bit/44.1kHz playback to formerly unimagined heights, as evidenced by the sterling accomplishments of the aforementioned Zanden and Abbingdon Music Research digital products. A third major branch of development (and certainly not the last) is the class of 24-bit upsampling players of which there are many. Probably the most radical of these designs is the now discontinued Reimyo CDP-777 which upsampled to 705.6kHz [the new Accustic Arts applies proprietary upsampling and Ed Meitner's new one-box CDP upsamples to twice the DSD rate - Ed.]! It seems we are at a stage of wildly divergent evolutionary paths of digital audio playback. One rule still applies as always: it is not just the technology that counts but the care and expertise demonstrated in its implementation. Go forth into this brave new world with caution then or a large bank account! In December 2007, we received the following note from Steve Nugent, Empirical's designer: "Stephen stated in the review: "The bass from the Spoiler goes deeper than the V/AN, it just does not have the mid-bass slam, which for me is so important for an involving listening experience. Neither is the Spoiler's bass as clean and informative as the bass from the V/AN. Putting it another way, the Spoiler's bass was more rounded and diffuse." We believe these things adequately address the issues in the review and take the Spoiler to a new level, competitive with the very best DACs on the market."